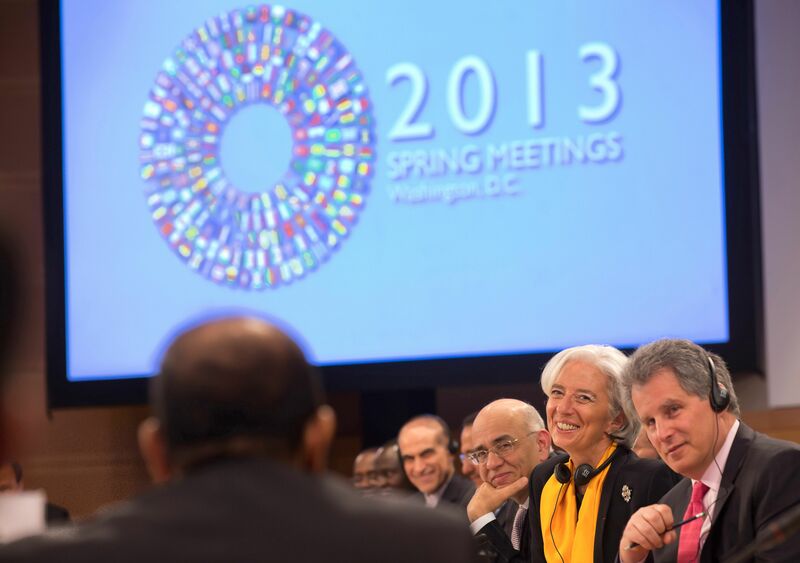 his picture provided by the International Monetary Fund shows IMF Managing Director Christine Lagarde (2nd R) smiles with IMF First Deputy Managing Director David Lipton (R) and IMF Director Masood Ahmed (C) smile at a meeting with members of MENA, Middle East and North Africa, on April 21, 2013 at the IMF Headquarters in Washington during the IMF/World Bank Spring Meetings. 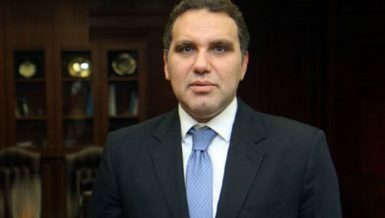 On the sidelines of a meeting between an Egyptian delegation and the International Monetary Fund (IMF) in Washington DC, Governor of the Central Bank of Egypt (CBE) Hesham Ramez stated that “both the IMF and the world at large is interested in and concerned with Egypt’s economic success”. He added that the Egyptian delegation detailed developments and steps being taken by the Egypt’s government to achieve economic reforms necessary for securing the proposed $4.8bn IMF loan, pointing out that IMF Managing Director Christine Lagarde’s response to such measures was “positive”. This came during statements to the press made by Ramez, who headed the Egyptian delegation, along with Minister of Finance Al-Morsi Hegazy and Minister of Planning and International Cooperation Ashraf El-Araby, regarding his recent meeting held with Lagarde. Ramez said that he had clarified during the meeting that Egypt’s reform programme sought to help “restructure the country’s economy at a time when the country suffered through a series of tough conditions not currently being faced by any other nation”. He noted that Egypt had “just come out of a revolution”, and that it would be “necessary to take into account all factors when undertaking reforms, including social factors and the ease with which such a programme could be implemented”. The CBE governor said that such measures would work to lessen the country’s widening budget deficit, and would help the government avoid massive currency inflation that will lead to higher prices of goods. He added that by the end of 2013 the country’s budget deficit would total between EGP 190bn and EGP 200bn, acknowledging that such deficits inevitably lead to increased inflation “which will affect Egypt’s poor more than anyone else”. Ramez went on to say that inflation should be a top priority that the government should work to overcome. The delegation clarified to Lagarde that Egypt’s economic reform programme was “founded on the need to create a positive investment environment for businesses operating in various sectors”, he said, particularly the tourism sector, “which contributes greatly to any increases seen in the country’s foreign currency reserves”. This would be affected through “increasing transparency and passing clear laws that would inform businessmen of all economic dimensions involved in investment”. rred in order to encourage confidence in the Egyptian market and within the country’s business community. “Only then would international investors risk pumping money into Egypt’s economy,” he said. He said that recent statistics released in March placed Egypt’s foreign currency reserves at EGP 13.5bn, adding that this number was expected to steadily increase with the implementation of the country’s economic reform programme. Ramez acknowledged that although Egypt was suffering through economic problems, the country’s banking sector was strong and “a number of European countries, such as Cyprus, strongly praised the country’s banking sector”, pointing to high levels of capital, rising levels of allocations, increased growth and high profits, as indicators that Egypt was qualified and prepared to accept an IMF loan. Further indicators included the independent nature of the Central Bank, which does not operate based on any specific political motives. He added that Egypt’s banking sector performed well throughout 2012 despite the country’s downgraded credit rating, achieving high profits in addition to decreasing its overall debt rates. He went on to say that securing the IMF loan would “demonstrate the strength and sound nature of Egypt’s economic reform programme”, and would encourage other international institutions, such as the World Bank and African Development Bank (ADB), to provide loans to the country’s government. He said that Egypt’s debt structure was strong; he cited that foreign debt totalled only 15% of GDP, a number lower than that of the international average, and that most of this debt was long-term, not needing to be paid back until 2040 or 2050. Both of these factors, he said, helped improve Egypt’s position in negotiations with the IMF. Ramez further stated that it would be easy to end black market trading of foreign currencies within Egypt, pointing to the recent release of $600m by the CBE as a factor which has helped to decrease the value of the dollar compared to the Egyptian pound. He further added that the country’s black market was weak, and that at the moment he and the CBE were most concerned with meeting the primary needs of businesses and citizens, and increasing the availability of food, medicine, petroleum products, and raw materials used in industry and for the production of goods. 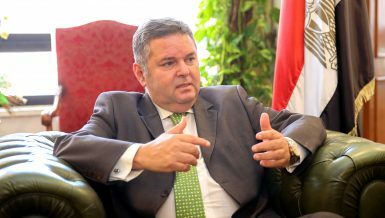 The Central Bank had issued directives to all those operating in Egypt’s banking sector to disburse as much hard currency as possible into the economy in order to help quicken the pace of recovery, he said, in addition to setting aside funds to pay for study-abroad programmes in Egyptian universities.